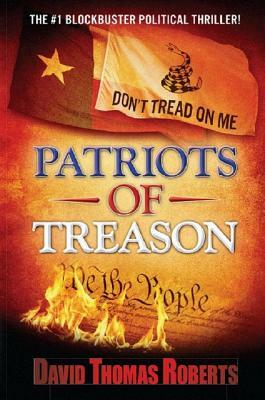 The first book in the Patriot Series by David Thomas Roberts, Patriots of Treason is a riveting political thriller that brings to life the worst-case scenario of a corrupt U.S. government that sends the United States into a constitutional crisis not seen since the Civil War. A President and his administration, filled with scandals and plagued by economic woes, surprisingly wins re-election to a second term largely based on an "October Surprise" and the promise of redistribution of the nation's wealth. An assassination attempt on election night throws the United States into chaos. When it is discovered that the assassin has ties to the administration's political antithesis, a diabolical conspiracy is launched to quash the political opposition and keep the assassin's true motives from the American people. When an ordinary Texas citizen is arrested, terrorized, and held without due process, the Governor of Texas dispatches iconic Texas Ranger Pops Younger to rescue him. The entire country becomes captivated in the suspense of the high-stakes chess game that pits the State of Texas and the Texas Rangers against the administration and the ATF that escalates to unprecedented proportions. An exciting and fast-paced political thriller, Patriots of Treason presents a very realistic 'what if' scenario that will keep you on the edge of your seat, regardless of your political persuasion. Naturalized Texan David Thomas Roberts’ first political thriller, "Patriots of Treason," was published in 2012. Demand for a sequel to the action-packed plot was carried forward in the second book in the series, "A State of Treason," which won numerous awards, including several Best Fiction Book of the Year 2016 awards from notable book clubs. Roberts' third book in his Patriot Series, "Purge on the Potomac," is set for release in early 2018. In between the political thrillers, Roberts, who is the CEO of a technology firm he founded in 1997, penned a business book, "Unemployable: How to be Successfully Unemployed Your Entire Life" in 2017. This book won the Texas Authors' Association Business Book of the Year 2017 Award. Roberts is a serial entrepreneur and is active in politics. His personal twitter account boasts 55,000+ followers. Roberts, who lives outside of Houston in Montgomery, Texas, has been married 34 years, and has 4 children and 3 grandchildren.